To answer an incoming call flip the lid of the phone open or if the phone is already open press the green answer key on the Aspera F28. To end a call flip the lid of the phone closed or press the red hang up / power key on the Aspera F28. To access the menu on the Aspera F28 press the top left key or the centre key. The Aspera F28 takes a Micro SD card, A Micro SD card adds storage to the phone. The Aspera F28 is compatible with up to 32GB Micro SD card. The Aspera F28 is Triband 3G meaning it will work on any Australian 3G network. Can I charge my F28 without the cradle? 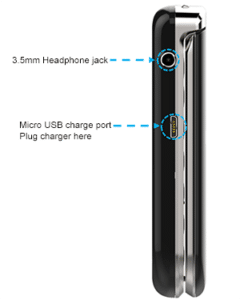 Yes, your Aspera F28 has a Micro USB charge port on the left side handset. You can unplug the charge cable from the cradle and plug it directly to your F28.